Peggy Carter, Steve Rogers’ World War II-era squeeze, from Captain America: The First Avenger will apparently not be returning for The Winter Soldier. 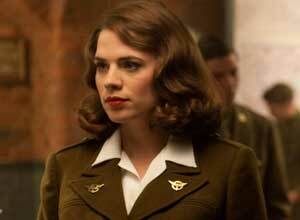 Hayley Atwell, who portrayed Carter in the first film revealed to Time Out London that she wouldn’t be returning to portray Carter in The Winter Soldier. While this does make a bit of sense considering the second film will take place in present day and Carter will have been left in the past. Discovering that Carter is no longer around and the fact that if the movie is following the comics Cap will get involved with Sharon Carter, Peggy’s niece, than it will add an interesting new layer to Cap’s character. Still, Marvel is well known for enjoying a cameo now and again so it is possible that Atwell could appear in a flashback to a time during the war or something along those lines. Chris Evans will obviously be returning as Steve Rogers/Captain America, now joined by fellow Avengers Alum Samuel L. Jackson, Scarlett Johansson, and Cobie Smulders. Sebastian Stan will also be returning for the second film as Bucky Barnes a.k.a. The Winter Soldier and new to the Marvel movieverse are Falcon and the villainous Crossbones played by Anthony Mackie and Frank Grillo respectively. Is this set for a 2013 or 2014 release?